The VF-25 Messiah is one of the latest variable fighters used by humans in 2059. It was developed as a replacement for the VF-171, the standard variable fighter in the New UN Spacy. Production prototypes were fielded by SMS in 2059, during Macross Frontier fleet’s voyage into the center of the Milky Way. Like previous variable fighters, the VF-25 can transform between 3 forms. Unique to other models however, is the EX-Gear power armor integrated into the cockpit which reduces the burden on the pilot during extreme maneuvers. With the addition of various modules, the VF-25 can be configured for multiple missions. The VF-25 is also the first variable fighter to be able to transform without having to eject its armored pack (unlike the VF-1). The VF-25S is an enhanced variant of the standard VF-25 assigned to team leaders. It also features a distinctive 4 laser armed head in Battroid mode. The build here depicts the VF-25S piloted by Skull Squadron leader Ozma Lee from the private military contractor SMS. Skull Squadron deployed with the Macross Frontier Fleet during the Vajra War. I’ve taken a look at this kit here. As mentioned in my preview, this kit is basically built up in subassemblies like a typical mecha kit. Fit is great as usual for a Hasegawa Macross kit. Even better is the option to model this kit wheels up straight out of box so fitting the gear doors wasn’t an issue. Another nice thing is that the thrusters can be assembled and painted separately so no masking was required at all for these parts. I decided to go with Ozma Lee’s VF-25S colors because I really liked the distintive skull marking on the back of his Messiah. The color scheme of 2 grays required quite a bit of masking but once done, it looked good. As best as I could, I masked and sprayed the yellow and black sections but I went with decals for the main chevrons on the fuselage. If you looked carefully, the shade of the painted and decal yellows are slightly different. Oh well, I’ll live with it. The decals are typical Hasegawa in that they take a while to get off their backing. They are not as thin as TwoBobs or Cartograph but are robust enough to take some re-positioning without tearing. Some of them did tear but they took to re-aligning quite easily. They reacted well with Mark Softer and thankfully, the carrier film surroundings are not thick so not much trimming was required. I went easy on the weathering with a panel wash and some light filters on random panels. I also added some streaks on the flaps, slats and in random spots. With the filter I also managed to slightly tone down the decals. It works OK but it’s something to improve on. The base is a round piece of wood purchased online. It was drilled with a small length of brass tube inserted and quickly sprayed flat black from a can. I then mounted a brass rod into the kit and this rod slots into the tube in the base. For my next build, I’ll try to make the rod removable on both ends to make the kit easier to handle. The kit decals went on OK. Some are robust and took handling and adjusting well but others did tear and some careful re-alignment was needed. I also made a big mistake in putting the SMS logo on the wrong side of the tailfins. I had to carefully re-hydrate them to move them to the correct side. In the process I managed to strip the black color on one of the tailfins. So I carefully sanded and buffed the area, masked off the existing decals, then re-sprayed black. It looks OK now. The whole point of going with Ozma Lee’s VF-25S colors is the very cool skull logo on the back of his VF-25. Thankfully Hasegawa designed it in 3 parts. Due to their intricate design, I went with decals for the yellow and black chevrons. The other yellow markings were masked and sprayed. The 2 shades of yellow don’t quite match but I’ll live with it. Once the decals have cured, the kit was wiped down, dusted and sprayed with another gloss coat to prepare for the panel wash and weathering. Weathering begins with a panel wash using Mig AMMO Deep Brown wash. Is it better than the usual oil paint sludge? Not really. But it’s ready to use out of the bottle. I’m not neat about it at all. What matters more is that the wash gets into all the panel lines. After 30 minutes or so, I wipe down the kit with a paper towel lightly dampened with odorless turpentine. I tried my best to wipe from the front to back direction. This follows the direction of airflow (er… yeah even though these things usually fly in a vacuum). Next I added filters, discoloration, faded the decals and streaks using the same brown wash in addition to white and black oil paints. The efforts are more obvious in the light gray areas. I made sure to add streaks on the wing actuators. The overall markings and (especially) the skull doesn’t look as stark now. Final assembly of the parts is next and I can call this done. Final product pictures have popped up on the internet and it looks good. But it’s a Wave kit, which based on my experience usually means the plastic would be softer, the molding would not be as sharp as Bandai or Hasegawa and there might be fit issues. Still, I’m glad someone is finally tackling this very rare variable fighter. This one’s coming @ 6,264 JPY in February. More pictures are on Hobbysearch. The VF-0 is a development variable fighter pressed into service during the Mayan conflict in 2008 (as depicted in Macross Zero). Introduced in 2004, it is a trial production and testbed using Overtechnology for future variable fighters like the VF-1. Originally tasked with tests and research, production was ramped up and pressed into combat service in 2008 against the Anti-UN Alliance. The VF-0 is equipped with conventional turbofan jet engines which limits its range, handling and power. The use of the conventional engine also necessitates a larger airframe. Future variable fighters would be fitted with thermonuclear reaction engines which address this major shortcoming. The VF-0C is a single-seat delta winged variant. The larger wings increased air combat manoeuvrability and a 20% greater payload compared to the A/S variant. The VF-0C was tested by the UN Marine Corps and 6 were produced for this purpose. This build depicts the squadron leader’s VF-0C from VMFAT-203 ‘Hawks’. 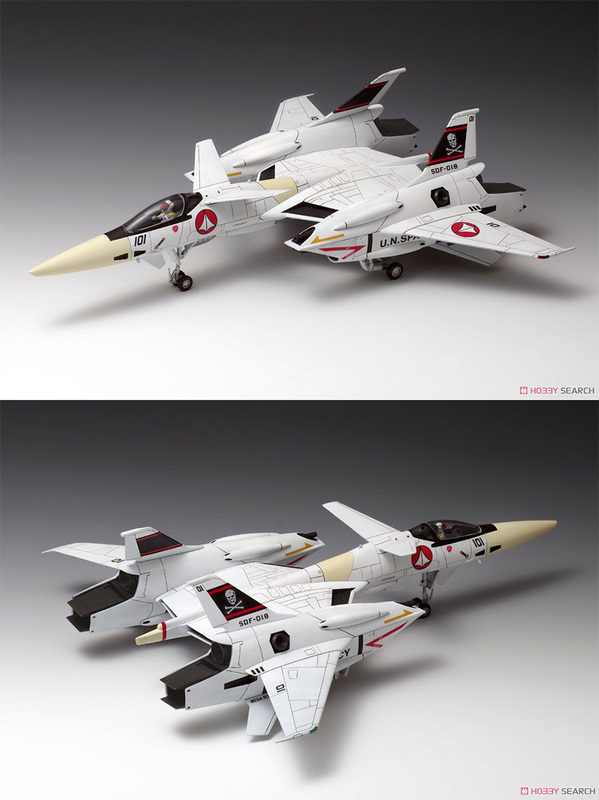 Hasegawa released a flurry of kits after Macross Zero premiered. The VF-0C however, did not actually appear in the OVA. While I’m not sure what was going on in the background, the VF-0C and VMFAT-203 Hawks are both canon now. Anyway, this kit is basically a combination of the VF-0A and VF-0D kits. 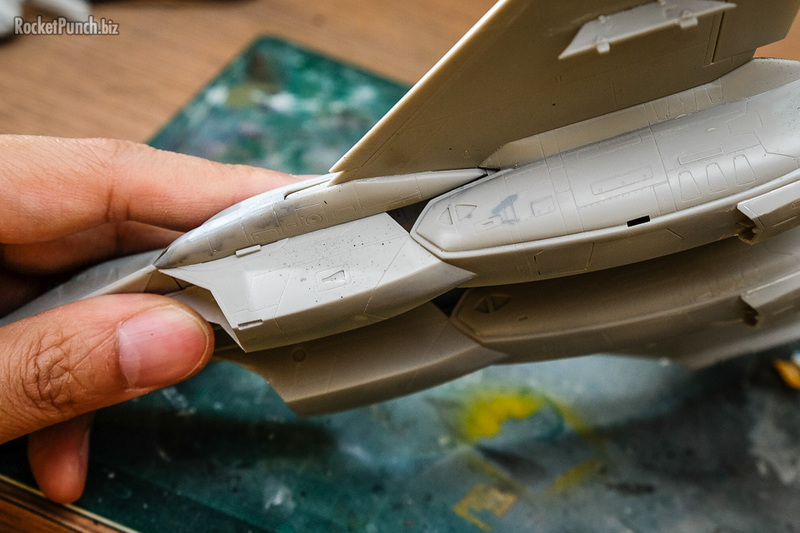 As usual with Hasegawa, the parts are crisply molded with fine panel lines. Details are nice although some ejection pin marks appear in places that boggles the mind: eg. in between the rear facing vanes on the tail. There are also a number of sink marks on some of the parts. Engine faces are provided both in the (somewhat shallow) intakes and the exhausts which is a nice touch. Another nice touch is the inclusion of a pilot figure. In fact, since this is pretty much a rebox of the VF-0D, there are enough parts for 2 pilots in the box. Nice. Another pleasant surprise is the inclusion of stores although it’s only a pair of rocket pods. Interestingly, there are options to mount the rocket pods dorsally ala the BAe Jaguar and British Electric Lightning. Markings are for 2 fighters: the colorful squadron leader and a low-viz line fighter. Construction allows for subassemblies as usual and there is a semi-serious effort to allow for the engines to be installed after final construction (it works but it’s not a drop-in asssembly). Since many components are hidden when everything is put together, I decided to go ahead with having as much of the kit together this time. The wings would prove to be a challenge to fit flush with the fuselage. Given another go I think I would fit the wings first before the legs/engines. Like my previous VF-22 build, I decided to do this kit wheels up. Like that one, this isn’t supposed to be modeled wheels up so some adjusting and trimming was required. The end result is not perfect. A brass rod was added and reinforced with epoxy putty in a spot that’s not visible externally. I managed to crack the front canopy so I sacrificed another VF-0 kit for the part. Otherwise, construction was relatively pain-free. I originally wanted a custom camouflage to the kit but ended up with a combination of the 2 kit options: it’ll have the squadron leader’s colorful markings but the color scheme of the line unit. It was a quick matter of black base, base color, mask with blutack, then the dark gray pattern up top. The gun, external tank and rocket pods are in the same color to reduce the amount of work. After the gloss coat has cured, it was time for the decals. I decided to forego with the small stencils for this one and after about 3 hours of work I was done. Typically of Hasegawa, the decals are thick and need copious amounts of Mark Softer. I also used Mark Setter to get some of the decals to conform around shapes. They look fine after drying overnight. The finished kit was given a simple diluted panel wash of raw umber oil paint. I then added some color variation with white, yellow, red, blue and black oil paints. Lastly I added some streaks on the main wings with a 6B pencil and swiping in the direction of air flow with my thumb. After a coat of flat varnish, I added the clear sensors on the nose (which I tinted brown with Tamiya Smoke) and handpainted in the wingtip lights with transparent red and blue over silver. Then it was final assembly with a mix of styrene cement, white glue and superglue.